Picture credit © Matt Mackey - Presseye.com Belfast - Northern Ireland - 1st January 2016 Guinness PRO12 Ulster Munster at the Kingspan Stadium, Belfast. Ulster's Nick Williams in action with Munster's Jack O'Donoghue. Picture credit © Matt Mackey - Presseye.com Belfast - Northern Ireland - 1st January 2016 Guinness PRO12 Ulster Munster at the Kingspan Stadium, Belfast. 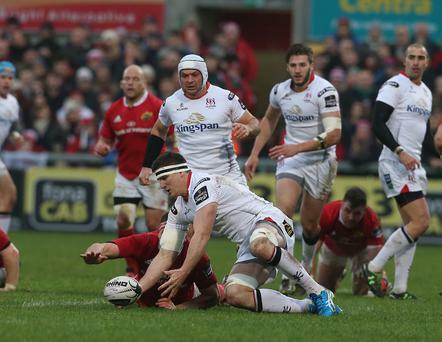 Ulster's Robbie Diack in action with Munster's Jack O'Donoghue. Picture credit © Matt Mackey - Presseye.com Belfast - Northern Ireland - 1st January 2016 Guinness PRO12 Ulster Munster at the Kingspan Stadium, Belfast. Ulster's Louis Ludik scores. Picture credit © Matt Mackey - Presseye.com Belfast - Northern Ireland - 1st January 2016 Guinness PRO12 Ulster Munster at the Kingspan Stadium, Belfast. Ulster's Andrew Trimble runs out for his 200th cap. Picture credit © Matt Mackey - Presseye.com Belfast - Northern Ireland - 1st January 2016 Guinness PRO12 Ulster Munster at the Kingspan Stadium, Belfast. Ulster's Stuart McCloskey in action with Munster's Ronan O'Mahony. Picture credit © Matt Mackey - Presseye.com Belfast - Northern Ireland - 1st January 2016 Guinness PRO12 Ulster Munster at the Kingspan Stadium, Belfast. Ulster's Chris Henry in action with Munster's Billy Holland. Picture credit © Matt Mackey - Presseye.com Belfast - Northern Ireland - 1st January 2016 Guinness PRO12 Ulster Munster at the Kingspan Stadium, Belfast. Ulster's Robbie Diack in action with Munster's Francis Saili. Picture credit © Matt Mackey - Presseye.com Belfast - Northern Ireland - 1st January 2016 Guinness PRO12 Ulster Munster at the Kingspan Stadium, Belfast. Ulster's Kyle McCall in action with Munster's Dave Kilcoyne. Picture credit © Matt Mackey - Presseye.com Belfast - Northern Ireland - 1st January 2016 Guinness PRO12 Ulster Munster at the Kingspan Stadium, Belfast. Ulster's Paddy Jackson in action with Munster's Mark Chisholm. Picture credit © Matt Mackey - Presseye.com Belfast - Northern Ireland - 1st January 2016 Guinness PRO12 Ulster Munster at the Kingspan Stadium, Belfast. Ulster's Nick Williams in action with Munster's Tomás O'Leary.